For over fifty years, Bob Dylan has confounded the expectations of both his critics and fans, who have tried again and again to put him in an artistic box of their own design. Dylan’s foray into spirits was to try his hand at the art of craft whiskey, collaborating with some of the best distillers from across the country. Together, we knew we could offer something special, something inspired by the idea of determining one’s own path despite what anyone else said. Bob Dylan pushes himself towards his creative conviction, unconcerned about acclaim or external validation. For decades, this restlessness has pushed him beyond just making music and into painting, welding, and now, whiskey. When the opportunity arose to partner with the legendary musician and cultural icon, to help him create a unique collection of whiskeys, it was both exhilarating and daunting. Dylan, after all, can be a relentless perfectionist and, some might say, inscrutable at times. It was clear that this was a passion project for Bob and that the only thing that mattered was to create whiskeys that had their own unique flavor, or as Bob puts it, each tell their own story. As with most things born from passion and imagination, initial cynicism often turned to unreserved praise when the Heaven’s Door trilogy was tasted. 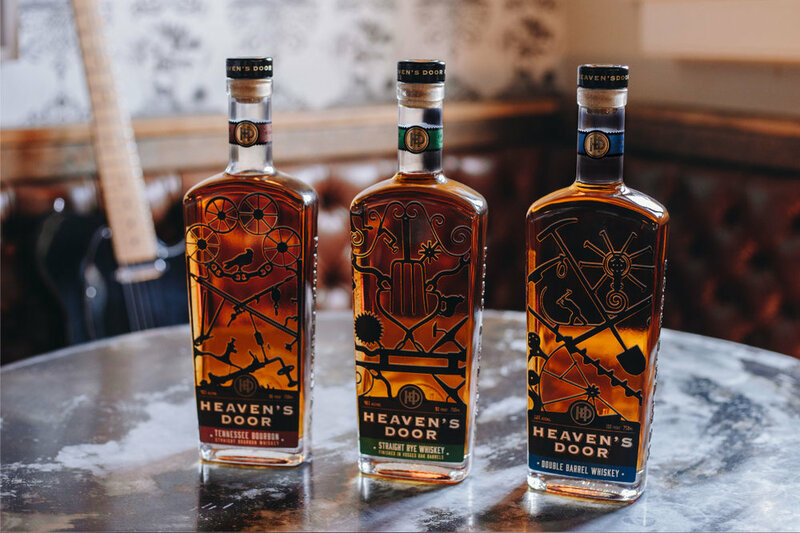 Each of the four Heaven’s Door expressions has medaled in key competitions internationally, including the 2018 San Francisco World Spirits Competition, the 2018 Ultimate Spirits Challenge, and the 2018 New York World Wine & Spirits Competition. Heaven’s Door has also earned compliments from some of the most heralded whiskey experts in the world. Our Tennessee Straight Bourbon is perhaps the most heralded of our award-winning whiskeys, since it was named the second-best bourbon at the 2018 Ultimate Spirits Challenge, beating out more than 80 competitors, many with long and storied pedigrees. With an unusual mash bill of thirty percent “small grains” and aged seven years in American oak, it also took home Double Gold in the New York World Wine & Spirits Competition and Gold at the San Francisco World Spirits Competition. When we were fine tuning this unique blend of three whiskeys, Bob remarked that he wanted it to “feel like being in a wood structure.” That led us on a journey of experimentation that culminated in our double-barrel whiskey, which earned Double Gold at the San Francisco World Spirits Competition. It also picked up a Silver at the New York World Wine & Spirits Competition and earned 93 points and an “Excellent” rating at the Ultimate Spirits Challenge. We sacrifice up to twenty percent of our rye to the “angel’s share,” the portion consumed by the cigar-shaped French oak barrels that we use to finish our rye whiskey. The wood is porous, but also highly aromatic, adding a smooth but spicy complexity, with hints of orange peel and coriander. Our Rye struck Gold at the San Francisco World Spirits, earned 94 points at the Ultimate Spirits Challenge and took Bronze at New York World Wine and Spirits. ‘After spending ten long, hot summers in a Tennessee rickhouse, this bourbon was so perfect that we felt any tinkering would have been a disservice,' said Perry, Head of Whiskey Development. And in the limited amount of time our 10-year has been on the market, whiskey critics have agreed with him.